After teaching her economics class, Rachel (Constance Wu) meets her boyfriend at a crowded Manhattan bar in New York City, just like hundreds of other New Yorkers on any given night. Only, she has no idea that they’re no ordinary couple. Nick (Henry Golding), her boyfriend of about a year, is an heir to one of the wealthiest real estate companies in Singapore. He keeps his finances a secret until they’re traveling to Singapore for his best friend’s wedding. When he smoothly leads her to a first-class cabin, she falls into a fairy tale-like story of a modern day “Cinderella,” with her prince upgraded to a businessman. While much of Jon M. Chu’s “Crazy Rich Asians” glitters in the film’s opulent settings, gilded homes and flashy outfits and jewels, it’s still just a simple love story made complicated by family. Through painfully honest and emotional moments, the movie becomes irresistibly relatable, even if most of us are not married to or dating secret millionaires. And though the film may feel overstuffed, it all works in service of its story. Unlike so many recent romantic comedy heroines, Rachel doesn’t long for something better or have her life in shambles. In fact, she’s a rather well put-together career woman, happily in love and excited (if nervous) to meet Nick’s family. Wu plays her as a quick-witted person, with a light and optimistic outlook that love will conquer all. I imagine most mother-in-laws would approve of an economic professor joining the family, but not Nick’s mom Eleanor (Michelle Yeoh). Her disapproval is written in every muscle of Yeoh’s performance, as if she’s physically rejecting the outsider her son has dragged into their mansion. Rachel lacks the monied pedigree Eleanor desires for her son, and each of the women’s exchanges doubles as a painful reminder of their class differences. 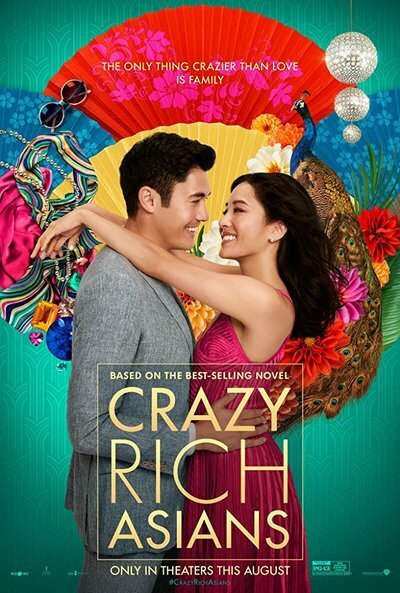 In addition to the money differences between characters, very few films have ever captured the pains of being first-generation American quite like “Crazy Rich Asians.” Rachel is Chinese-American, which her best friend Peik Lin (Awkwafina) jokes is why her potential in-laws look down on her as a “banana”—yellow on the outside, white on the inside. It can feel like a curse to feel like an outsider in both the country you were born in or the one your parents come from. For Rachel, those feelings ultimately become a strength instead of a perceived weakness. Her choice to be proud about her immigrant roots in the face of Eleanor’s shaming becomes an emotional affirmation for others like her. “Crazy Rich Asians” may have the look of a luxurious 1930s MGM comedy like “Dinner at Eight,” but there are also a number of delectable scenes for cultural specificity, like the movie’s attention towards food. The camera gets close enough to the steaming pots and flamelicked meats to make a mouth water. Those scenes also serve a deeper purpose: they tie together the importance of food, culture and relationships around a dinner table. One dumpling-making sequence doubles as commentary on tradition and how families share it with younger generations. This movie knows its audience isn’t just there for the luxury tour, and the film spends a considerable time establishing how great everyone looks, especially the men. Chu’s camera ogles its male characters, focusing on their chests when they’re either buttoning or unbuttoning their shirts. If this is Chu’s approximation of the female gaze for a target audience, it works. In just a single tracking shot following a character (Pierre Png) from the steamy shower to his bedroom, the shot defies decades of negative stereotypes depicting Asian men as sexless or unsexy. However, they’re not reduced to decorative eye candy, but have roles to play in the movie’s narrative opposite their female counterparts. Chu's film is also careful to avoid painting all the wealthy characters as stock character villains. The “us vs. them” division is delightfully more complicated, and luckily Rachel finds allies among Nick’s family to help her endure Eleanor’s judgement and some cruel “Mean Girls” bullying from jealous rich rivals. The movie also explores the differences of old and new money status through Peik Lin’s family against Nick’s stately family in a variety of ways, like how much more warmly they receive an outsider like Rachel and their gaudy tastes in home decor. As Peik Lin, Awkwafina’s stellar performance interrupts some of the film’s most dramatic moments with her wit and wild antics. When she arrives in casual clothes to one of the Young family’s fancy soirees, she rifles through garment bags in the trunk of her car and picks one out with a pair of heels. She waves off Rachel’s response as if carrying an emergency cocktail dress at all times was perfectly normal. As much as this is a love story, “Crazy Rich Asians” is very much about powerful women at its center. We catch a glimpse of some of the anti-Asian discrimination Eleanor faced back when Nick was a child, and how she wields wealth like a weapon against enemies and intruders. In the case of Astrid (Gemma Chan), one of Nick’s cousins, she later uses her financial standing in an empowering moment against her husband. For these women, wealth allows them to fight for themselves. To show that power is not just concentrated in the hands of the rich characters, Rachel also gets her moment to shine in a battle of wits against Eleanor. And for once, Rachel has something Nick doesn’t: unconditional support from mom. Rachel is shown to be very close to her mother (Tan Kheng Hua) through several tender moments, and their bond becomes another source of strength for female characters. I left "Crazy Rich Asians" beaming, not because of the film’s wild parties with synchronized swimmers or the over-the-top wedding of Nick’s best friend, but because of how much love is in the film between a mother and a daughter, couples and among friends and family. To see an American audience identify with the Hyphen American experience—my experience and that of Rachel’s—felt rewarding on an entirely different level. I was elated to identify with the struggle of juggling parents’ approval with feelings for a partner. I may not share the financial or cultural background of the characters, but I felt invited to celebrate in the emotions on-screen and those around me.